it has now been several years since i documented this initial treatment journey and on a daily basis it still receives many hits as well as many emails from readers whom are seeking insight, clarity and guidance on this subject, and to that end i have made some important updates, additions, elaborations and clarifications. i will be going through each and every volume of this series and providing updates and additional knowledge and insights wherever possible. In the interim, i extend to anyone who is currently dealing with a health issue or seeking support in reaching optimal wellness, an invitation to connect with us directly, if there is something we can do to support you, especially if you have landed here by way of seeking out information on alternative cancer treatments- or if you are a woman who is undergoing hormonal issues or reproductive challenges, please reach out if you feel it is right for you. There is so much holistic wisdom to discover and, as it is our duty to serve the awakening and empowering of humanity, our goal is to empower you become a Nourished Warrior – and help you build an arsenal for thriving. Last wednesday i went for an ultrasound: i posted a video on the results here. It was pretty shocking to say the least- to walk into the sonographer’s office and see that the view of my insides from the ultrasound machine- was completely CLEAR! … how could i have had an entire reproductive system, riddled with fibroids and follicles and an unidentified mass that was potentially cancerous- just 10 short days before that??? The ultrasound technician, in fact, was so impressed by the health of my uterus she complimented me on the photos in such a way that it seemed she might want to keep them as evidence of what natural medicine is capable of- I shared with her my experiment although not the nature of the medicine, and she was slightly shocked but definitely delighted to hear of another case in which a patient had cured themselves through natural means…During the ultrasound she seemed incredibly confused as to why i was even in her office at all, she quite literally could only see a view of a very healthy uterus, showing no signs of PCOS, no signs of a cyst, no signs of any abnormalities whatsoever, and i left her office with a sense of disbelief and profound relief- even while i still need to visit the specialist again on the 9th in order to receive the biopsy results, but from an ovarian and uterine standpoint i seem to be nothing if not vital, well, healthy and perfectly normal for a 32 year old woman. This put a little bit of an unexpected twist on my plans to continue this series, and documenting the progression of healing which we originally thought would at least be as long as the wait until my next appointment as high-quality medicinal cannabis can typically take up to one month to build a cumulative effect in the body and build momentum enough to begin the eradication of cancer cells. Having said that- at this juncture, there are currently alot of unanswered questions for me, were the doctors wrong? was there ever any suspected cancer to begin with? did they read the first ultrasound wrong? was he mistaken in thinking i had a giant cyst? ( not even mentioning the immediate question- which is why a Dr. would even bring up the word ‘cancer’ without any diagnostic evidence to back it up..? A 2004 study also found that cytotoxic chemotherapy does very little towards enhancing cancer survivors’ 5-year survival rates. Research, led by scientists from the Department of Radiation Oncology at the Northern Sydney Cancer Centre of the Royal North Shore Hospital, located in Sydney, Australia, raised serious questions about the actual efficacy of curative and adjuvant chemotherapies. What they found was that chemo only contributed 2.3 percent to the 5-year survival rate in adults, and in the U.S., that number dropped to 2.1 percent. The AMRC urges doctors and patients to question whether or not particular treatments are necessary and while i am not a medical professional i certainly share the sentiment. The word ‘cure’ is rather a loaded term. Its very definition infers a restoration of health, a healing ‘ making well, whole, or right. ‘ I would pose to any readers whom are currently in the midst of dealing with ‘disease’ whether it is your own, or the illness of a loved one, to examine the current course of action being prescribed to ‘cure’ said illness, consider the statement which is very often made by those who are undergoing allopathic cancer treatment ‘ the cure is worse than the disease‘ – a statement which for those who have been subject to the abuses of the for-profit industry, must ring true. If you are on this page, reading these words, chances are that you are already of the mindset that these conventional methods are not serving the proposed purpose and have opened your mind just enough perhaps to google one of the keywords which led you here, which is the first step on the journey to true healing. In the age in which we live, information is a crucial currency to waking up and taking control over your own destiny. The truth is, that the truth is… terrifying, but beyond that terror is liberation. Beyond the fear that is instilled by every aspect of our programmed reality, is an understanding that your birth right is to thrive. In America the reality is that 1 in 3 people will have cancer in their lifetime; a crazy number given that in your Grandparents time it was more like 1-15- the sickest part of this ( IMO ) is that patients are actually getting younger and younger. post- ultrasound and much introspection i wondered how i had gone from fibroids and giant ovarian masses and biopsies to what would inevitably become a clear pathology. given the general stock-answers on ‘efficacy’ and such, typically given by western medicine doctors’ it was a tough decision as to whether i would share with him the self-treatment regime i’d been undergoing, basing the extent in which i would share- upon his reaction to the ultrasound, and how he intends to account for the things which he told me ( or rather, filled my head with ) at my previous appointment… i truly wish i could take my little iPod into his office and record his explanation of the current state of the union that is my body- and in fact if there is a way to do this on the DL, spy-styles, i believe i will try to do so – even just so i can share the reality of how a western medicine doctor addresses his potential mistakes, or addresses inexplicable healing happening in the body of a patient whom was previously thought to house potential ‘cancerous cells’..
another important addition to this content, is to draw a correlation between ‘cancer’ and women’s issues such as uterine fibroids, PCOS etc. ( all of the above i had been at one time or another been supposedly ‘diagnosed with’ ) to speak to a common misconception about cancer; It is believed & very much portrayed as a ‘genetic’ disease. When it is in fact a metabolic disease. Let me say that clearly: Cancer is not a genetic disease it is a metabolic disease. Furthering the agenda of convincing you that cancer is caused by ‘genetic abnormalities’ is the supposed ‘research’ conducted for the pharmaceutical industry which serves the drug companies bottom line and their narrative very well. They want you to believe that a ‘cure’ needs to be based upon genetics, and thus more and more drugs need to be developed to match each individual’s genetic profile and specific ‘type of cancer’ ( this inaccurate, ill-conceived belief system gets them hard- excitement around genetics has its roots in knowing that these drugs and medical treatments only make them rich vs. offer up cures to most cancers…a belief system that fuels the sick cycle referred to as ‘ cut poison burn‘ by filmmaker Wayne Chester in the documentary ‘cut poison burn’ ) They want you to stop asking why this poison cut burn protocol is the only approved treatment for cancer. Why is surgery, radiation and chemo the only medically advised avenue? These treatments do not cure cancer. They fuel sickness and fill pockets. The narrative they would have you believe does not involve you asking questions about where the ‘cancer research’ money goes. Why has the 4decadelong, so-called ‘war on cancer’ perpetually failed to produce any cures, let alone any results at all? Why hasn’t there been any new FDA approved therapies in 100 years? These are the questions they don’t want you to ask, their narrative would have you stand ignorantly and complicit-ly by, never questioning while every single day thousands die..
perspective: this is an excerpt from a documentary ‘ride with Larry’ a former South Dakota Police Officer and 20 year Parkinson’s Sufferer. Symptoms include severe dyskinesia, tremors, speech loss etc… Aided by A Cannabis advocate and fellow Parkinson’s patient, Larry showcases the raw power of this plant medicine. REST: I have also been sleeping alot more than usual, there was a time in my life, where i was near insomniac, although i considered it being an ‘intentional insomniac’, because i had so much fire and so much drive that i would workout 3-4 hours per day at the gym, i would arrive home and spend the next 16 hours or so working – perhaps sleep an average of 3 or 4 hours, and get up to do it all again. I am no longer able to achieve this robotic-method of pushing myself into exhaustion, when the plant energy tells me i need to sleep- i sleep. this weekend i probably slept a total of 22 hours give or take, much more than usual for me- even as i have improved my schedule from years ago- i still strive to keep sleep last on my agenda ( despite being reminded continuously by my close friend who is a complete advocate for sleep as a cure-all medicine in itself )… with this improvement in my rest, i feel my body is better able to perform the transformation that it needs to, without taxing my reserves too much. I feel clearer on what my mission in this life is, and every day i get closer to uncovering some of the answers i have been seeking for so long, whether that’s how to build a sustainable business without compromising my heart or my integrity…or how to live consciously in a world that is imprisoned by suffering and deceit….facing these questions becomes easier. Insight arrives without the anxiety that came alongside truth for most of my life…. and for this gift- I have to take a moment to thank the medicine for continuing to align me, from the inside out- as it re-organizes my DNA and equalizes my frequency, bringing me to a higher vibration, i evolve without any need for hours of meditation or days and days of fasting, or any other ancient or esoteric tool by way to achieve that higher level.. i simply find these states within. every moment is a blessing as i begin to vibrate higher, and rid myself one by one, of the toxins of my past, and the baggage from my body- the best part about this supplementation process is that by taking this medicine, in this way, it’s just like another herbal supplement… none of the psychoactive THC-induced effects, it’s all CBD-vibes – which in essence makes me feel as if i am glowing from the inside out. being fundamentally shifted to a higher frequency- the plant power works its magic and it feels like i am taking a tonic of pure-life… and as a willing co-creator, as a conscious witness to this… my heart heals from its previous- breaks-a plenty-and i am but am a willing co-conspirator, acting as the temple for the battle for optimal wellness. 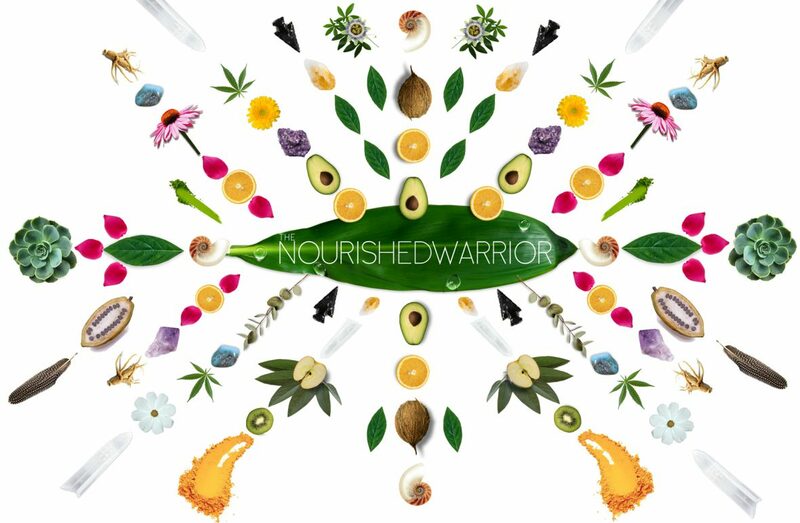 The Nourished Warrior will always prevail. I have only one real mission here and that is to awaken people to the breadth of potential there is for healing. For taking control of your health. Taking your wellness out of the hands of those who profit from your sickness and becoming a warrior for thriving. Real cures are out there, within your reach and will not cost you your life, or your life-savings. For those individuals who are seeking out alternative treatments, inclusive of medicinal cannabis and would like more information, you are welcome to connect with us- via this page. if you are seeking holistic healing and are approved for the ACMPR program in Canada- please contact us for information on a raw, full-spectrum, CBD-rich supplement. i extend to anyone who is currently dealing with a health issue or seeking support in reaching optimal wellness, an invitation to connect with us directly, if there is something we can do to support you, especially if you have landed here by way of seeking out information on alternative cancer treatments- or if you are a woman who is undergoing hormonal issues or reproductive challenges, please reach out if you feel it is right for you. There is so much holistic wisdom to discover and, as it is our duty to serve the awakening and empowering of humanity, our goal is to empower you become a Nourished Warrior – and help you build an arsenal for thriving. contact via this page. The Nourished Warrior pro­vides gen­eral infor­ma­tion, opinions and dis­cus­sion about med­i­cine, health and related sub­jects. Words and other con­tent pro­vided herein and/or via any linked mate­ri­als, are not intended and should not be con­strued as med­ical advice. If the reader or any other per­son has a med­ical con­cern, he or she should con­sult with an appropriately-licensed physi­cian or other health care worker. Never dis­re­gard pro­fes­sional med­ical advice or delay in seek­ing it because of some­thing you have read on this blog or in any linked materials. In short: please make discernment and conscious, pro-active choices related to your health part of your Nourished Warrior arsenal.